Many great outdoor ideas start with, “Let’s build a deck!” Almost like an outdoor living room, a new deck can be an elaborate multilevel expanse or simply an attractive, comfortable retreat with built-in seating, maybe a planter or two. If you already have a deck, consider enhancing its appeal. Include more spaces for outdoor dining and entertaining, add an enclosure for a spa, a trellis for shade, or expand available seating areas. Often a growing family finds itself looking for more livable space … its right in your own backyard! Whatever the design, pressure-treated Southern Pine lumber is the ideal choice for your new deck or deck addition. Available in a wide variety of grades and sizes, treated Southern Pine is easy to work, and can be painted or stained, just like untreated wood. In fact, treated lumber delivers all the favorable properties of wood, plus a bonus: it resists decay and termite attack even in the most severe exposures. You can romp barefoot on it, stretch out and snooze on it, or use it for a favorite picnic spot. You can, in fact, do just about anything on a pressure-treated Southern Pine deck because preservatively treated wood is safe for people, pets and the environment. Steps and a patio door provide dual entries to this elevated bi-level deck. Visual appeal is enhanced with the decking surface installed diagonally. A treated Southern Pine deck makes an ideal outdoor play area. This garden deck combines seating, planters, and an arbor. 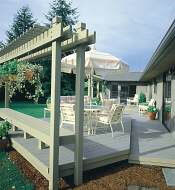 Freestanding Decks: Perfect for smaller properties or where an attached deck is not practical. This Compact Deck measures 10’x10′ and can be built in a weekend. Comfort & Color: A pressure-treated Southern Pine deck blends naturally with the landscape. 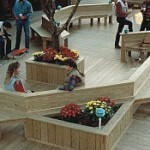 Design opportunities for seating and planters are unlimited. Contemporary Designs: A deck can compliment the architectural style of any home.